The story of Elijah the prophet in the Bible begins with Elijah telling king Ahab that there would not be any rain. 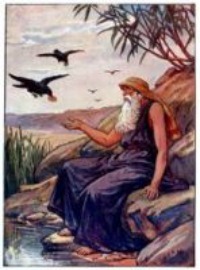 God than tells Elijah to go and hide from Ahab by the brook Cherrith. 3 .Get thee hence, and turn thee eastward, and hide thyself by the brook Cherith, that is before Jordan. While at the brook Cherrith Elijah the prophet is fed by ravens. In the 3rd year of no rain and a famine, God tell's Elijah to show himself to king Ahab. 1. And it came to pass after many days, that the word of the Lord came to Elijah in the third year, saying, Go, shew thyself unto Ahab; and I will send rain upon the earth. 2. And Elijah went to shew himself unto Ahab. And there was a sore famine in Samaria. Mean while, Ahab had sent Obadiah in one direction while he went in the other direction to look for grass for the livestock. Along the way Obadiah meets up with Elijah the prophet. 12. And it shall come to pass, as soon as I am gone from thee, that the Spirit of the Lord shall carry thee whither I know not; and so when I come and tell Ahab, and he cannot find thee, he shall slay me: but I thy servant fear the Lord from my youth. 14. And now thou sayest, Go, tell thy lord, Behold, Elijah is here: and he shall slay me. When King Ahab meets Elijah the prophet he accuses him of causing trouble for Israel. Elijah reminds Ahab that the trouble was caused by him and his forefathers who had turned from following the commandments of God. After the show down Elijah states to Ahab what God told him in verse 1 that there would be rain. Elijah the prophet then provides us with an example of how to take God at His word. God has told Elijah that He will send rain. 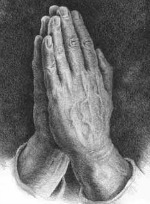 Elijah believes the word of God and does not cease to pray until God fulfills His word. 44. And it came to pass at the seventh time, that he said, Behold, there ariseth a little cloud out of the sea, like a man's hand. And he said, Go up, say unto Ahab, Prepare thy chariot, and get thee down that the rain stop thee not.